Darlington have signed striker James Walshaw from Blue Square Bet North side Guiseley on a one-year deal. The 27-year-old opted to leave Nethermoor Park for a move to full-time football with the Quakers, having scored 32 goals in 2010-11. "James was a sought-after player," Darlington boss Mark Cooper said. "We're pleased to make a breakthrough because it's a difficult time of the year, when players and clubs are holding out for the best deal." Cooper added: "We met with James last week and he obviously liked the look of the place and what we had to say. "He's an ambitious lad who's come through the leagues and he's hungry to do well. "He fits into our work ethos. He's strong, hard-working and has a good track record of scoring goals. "He wants to achieve as a professional footballer and I'm confident he'll do well for us." 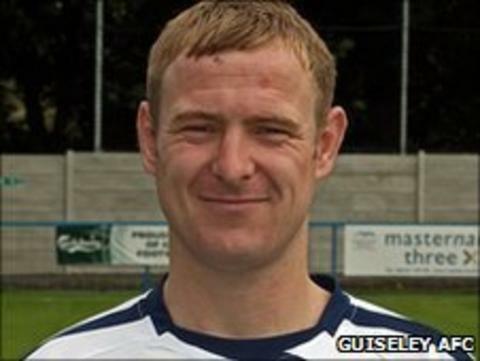 Walshaw, who also played for Ossett Town, Wakefield and Farsley Celtic, joined the West Yorkshire club in 2009, and has earned England C honours. "I've spoken to James. He's told me he won't be coming back to Guiseley, he's signing full-time," Guiseley boss Steve Kittrick told BBC Leeds. "There's a pride, I've worked with him for the last six years, and he needs to play full-time. "Full-time training, get other angles on certain aspects of the game and I'm sure he'll go from strength to strength at the right club. "His goalscoring stands up for itself, but it's a big ask for James, he's had to give his job up."